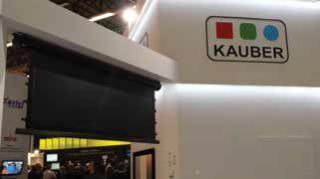 Polish projection screen maker Kauber is deterred from expanding into the United States because of tariffs on foreign products. Attending my first Integrated Systems Europe was an education in culture, business, and how much we all face the same problems. Before setting out, I had written about what we all expected to see at ISE 2015. Most of those technologies were apparent, but what wasn’t clear at the start was how the AV professionals would impact and shape my trip. There was, of course, 4K/UHD everywhere. The LED screens, the “Made in England” waterproof displays, and the projectors all had 4K technology at the ready. Crestron had its upgrades to Pyng on display. Microsoft had something in its booth other than couches. In fact, the Microsoft booth was one of the more heavily trafficked spaces with the Surface Pro and the software giant’s step into VTC and collaboration. A piece of technology that was not on my radar was image mapping. Not that this is a new technology, it was the way it was being shown. Nearly every projector manufacturer had an imbedded flavor of projection mapping, giving them the ability to sculpt the final image onto whatever surface they chose. One of the more impressive displays of this was Panasonic’s image mapping onto a Tesla car. Very slick indeed. One of my goals was to purposely connect with manufacturers that either have little to no presence in the states. Being what I call the typical “big, dumb American,” I wanted to expand my understanding of the audiovisual industry outside the states. They face a number of the same issues and problems just from a different perspective. Take alfalite for example, an LED panel manufacturer from Spain. Over the last year alfalite has come to the same realization some U.S. companies have. That is that the cost of bringing manufacturing back to their home countries from China makes sense. The cost of Chinese labor is on the rise and there seems to be a backlash against some Chinese manufacturers, specifically LED makers, and the costs of shipping all add up to making it more feasible to bring its LEDs back home to Spain. By the time you read this, alfalite will have opened a new manufacturing facility in Spain, making it one of the only Eurozone LED companies. In addition, alfalite is aiming its sites on the North American market. According to Eric Flagg, the U.S. sales manager, the company will be looking for distributors and integrators in this part of the world. “We want customers for life,” Flagg said, which is one reason they are taking more quality control over their manufacturing. A company that has no plans for a U.S. presence is projection screen maker Kauber. It is secure in its European presence based in Poland. When pressed for why the American market is not attractive, they cited the American taxes and tariffs on foreign products as a key deterrent to entering the market. Spanish LED manufacturer alfalite has recently returned its manufacturing operations to Spain, and the company is expanding in the United States. Another of my key goals was to talk with European and Middle East integrators. The idea was to see what makes them different, and what makes them the same as us in America. The key difference is the laid back attitude of the Europeans in general. This is from both manufacturers and integrators. There is not the in-your-face competitiveness as we in North America are almost born with. That is not to say they don’t want to win or succeed, it is just not what drives them. There was an integrator from France that I met, Jaques. His main reason for coming was to see the latest from the usual companies. More than that, though, it was to connect with his competitors and find out from them things he can do better. I loved that attitude. It is something we tend to miss on this side of the Atlantic sometimes. A technology manager from the UK shared his trials of getting class capture instituted at his university. It was not the same strategy as some institutions in the states. The UK university has taken the long approach and slowly instituted these systems in a handful of classrooms and got feedback from faculty. In American colleges, I have heard stories where administrations have basically mandated an idea, and it happened. Again, just a different approach. As ISE has become the largest AV show in the world, with almost 60,000 attendees this year, it would be worth the trip for any North American integrator or consultant. As the director of operations for a programming house, it was a great networking opportunity as well as a learning experience. The fact that it is a combination of both InfoComm and CEDIA gave me some guilty-pleasure sneaks as well, as I fawned over blown glass speakers and the like. ISE 2015 was time and money well spent, and next year’s show will be on the top of my list of shows to attend. Tim Albright is the founder of AVNation and is the driving force behind the AVNation network. Tim is a Certified Technology Specialist (CTS) certified by InfoComm International. He holds a bachelor’s from Greenville College and is pursuing a master��s in mass communications from Southern Illinois University at Edwardsville. He has designed systems for churches large and small, fortune 500 companies and education facilities. Follow Tim on twitter @tdalbright.